You’ll love our groundbreaking Dancing For Birth™ class—it’s the “trifecta” of birth preparation: feel-good prenatal fitness, essential childbirth education, and celebration of pregnancy and birth, all rolled into one profound & powerful class that supports you at every stage, from pre-conception through to motherhood. Each signature move and technique is designed to guide your baby into the optimal fetal position, and enable you to effectively work with your baby and your body for a birth experience you’ll love. Discover the keys to activating your birth instincts for a safer, easier birth! After you give birth, come full circle and wear your baby to class for postnatal fitness, parenting education and bonding with your baby. What if you could harness gravity to your advantage during labor? How much more effective will birth be when you utilise the pushing position that as much as doubles the size of your pelvic outlet for ease of birth? How would your birth plans change if you knew how to move your body in order to correct your baby’s breech or posterior position? Dancing For Birth™ Founder, renowned birth expert Stephanie Larson, has innovated an effective new childbirth method that makes all this possible. 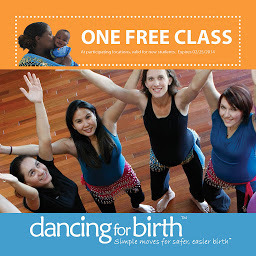 Join a weekly Dancing For Birth™ class now and gain support that extends all the way through pregnancy, birth and motherhood. With each class you’ll learn techniques that support a safer, easier birth, and you’ll increase your confidence for empowered, enjoyable birth and mothering. Find a class near you. Women often come to class simply for fun and fitness, and find that they gain more than they expected to. “This class was fun and informative. 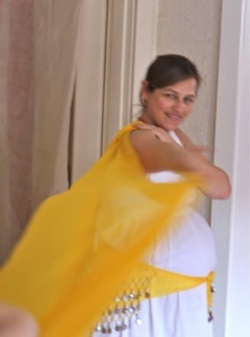 I love dancing and I was excited to learn a how to incorporate it into this whole [pregnancy and birth] experience. I gained great moves to help me feel good, and birthing positions and knowledge of what I can do to help me through labor”, said Melanie Eng, pregnant with her first child. Babies whose mothers take Dancing For Birth™ prenatal and postnatal dance classes love the motion of dancing and are easily soothed after birth by being held while you dance. You will also regain your pre-pregnancy shape and tone more quickly when you continue Dancing For Birth™classes with your baby after their birth. Register here for your FREE class! "Dancing For Birth™ class participants report experiencing low levels of discomfort, few or no interventions, brief labours and high levels of satisfaction during their births"